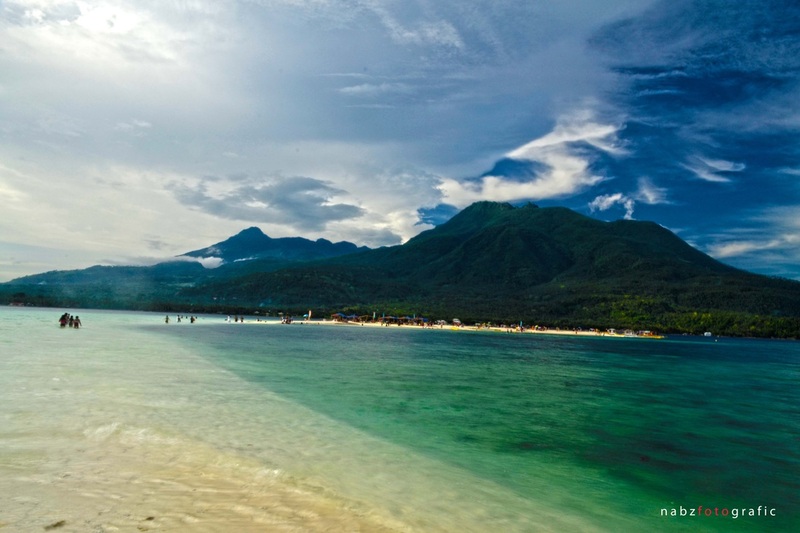 Camiguin is set to be the smallest island in the Philippines after Batanes. 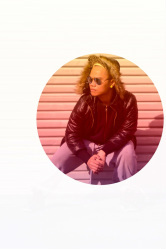 will be sharing to you later). This island offers a lot of activities and lots of places you can visit. Amongst would be Katibawasan falls, Ardent hot spring, intriguing Soda pool, walkway to the to old Vulcan, Sunken cemetery, Guiob old church ruins, Sto. niño cold spring and a lot more. Surely, Camiguin is worth visiting. It was bright sunny morning when we arrived at the Camiguin airport located in Mambajao. Way back, you can reach this beautiful island via Cagayan which is the nearest one if you're going to take a plane. Then from Cagayan you will need to ride a van or bus which will take approximately two hours going to Balingoan. 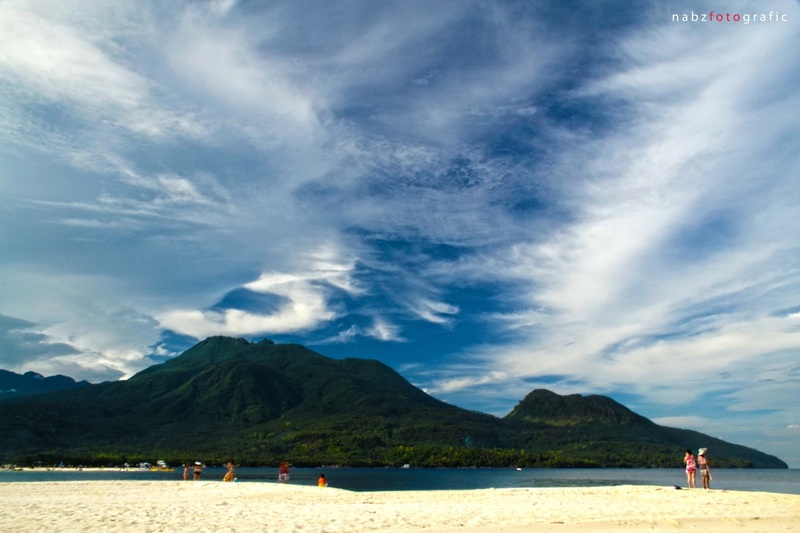 Once you arrive, you need to take a ferry bound to Camiguin island which will take an hour. But now it's so easy to visit this place. Thanks to Cebu Pacific who just recently launched last April 2013 its direct flight from Cebu to Camiguin. 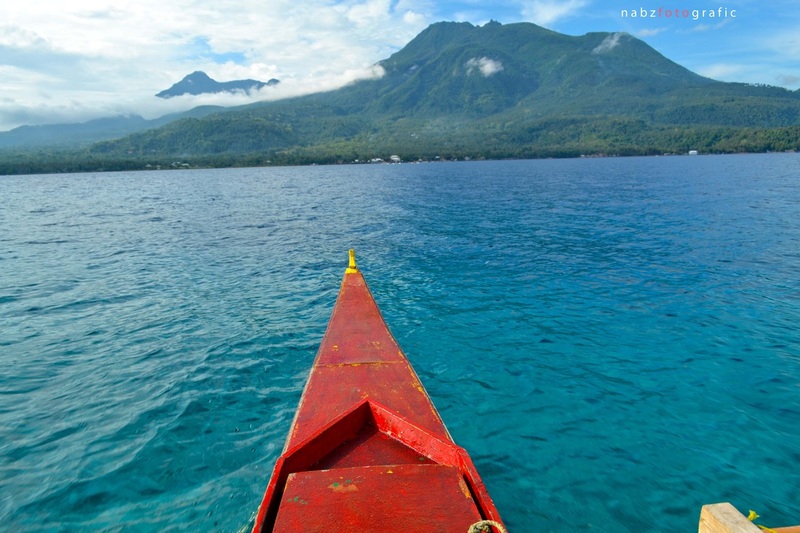 Now, it will take approximately 30 minutes and walaaaaa the enticing Camiguin will welcome you. Information desk upon arriving at the airport. Usually they have pamphlets of recommended hotels in Camiguin where any guests can take it for their choice of hotels they may want to consider. I'm just so glad there's direct flight in this island. Going out of the airport. People from Camiguin are truly friendly and hospitable. We arrived at the airport around 7:45am but our family who came from Gingoog fetch us almost 10 am. While waiting outside of the airport a lot of their airport personnel always greets us "welcome to Camiguin" with smile. One plane pilot even told us " you'll love Camiguin. Even if we're just inside the vicinity of the airport by just knowing how nice the people are in this island already tells us that we will surely love the place. Our first stop was Sto. 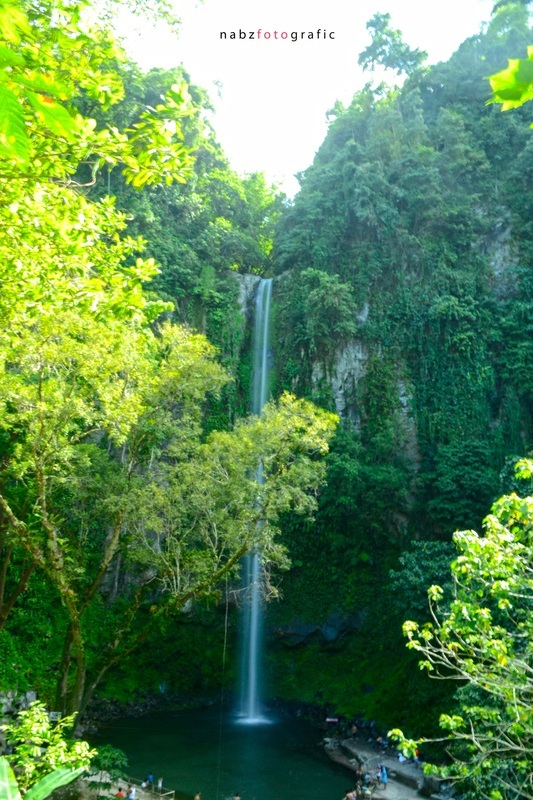 Niño cold spring located in Catarman, Camiguin. This famous cold spring is so freaking cold which is perfect on scorching hot summer. The water gives you refreshing feeling after swimming in their pool. Their pool has two sections: one is kiddie pool and the huge pool for teens and adults. Please check the picture below for their prices. Bukolicious fresh coconut juice which they sell inside the waterpark for only P20. Top view of Sto. Ninyo cold spring. That's my kiddo giddily playing. Surely, you will love this place as I did. Their entrance fee is P20 each. Forgot if the price for kids is half. They also have plenty of souvenirs shop just outside the water park. Our next stop was bura soda waterpark which is very intriguing due to its name soda. Accordingly the water in this place has a streaming natural soda thus the name soda waterpark arose. When I tried tasting the water it doesn't taste like soda from any softdrinks but it has its similar taste from a diluted version of sprite. Entrance fee is P20 per head from 9 years old up. 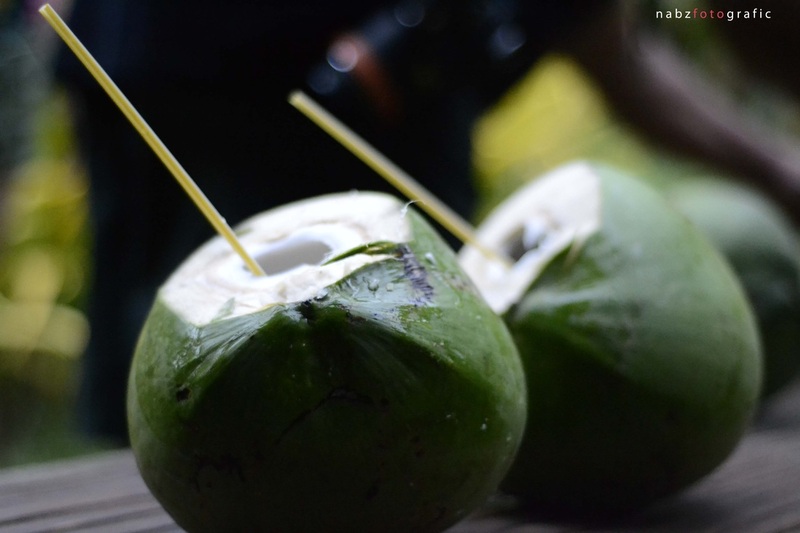 After visiting soda water park we went straight to a house owned by a friend of my mother-in-law who welcomed us with fresh buko juice and cooked dinner for us. Needless to say how hospitable people from Camiguin are. Our second day was jam packed. We visited several tourists spots in just a day. Our first stop was this old church ruins which was devastated by the volcanic eruption year 1871. This island is really interesting as there are still many ruins left.If you love history subject then you will like this place. Inside the church ruins. It looks small from the outside but believe me it's huge inside. The feeling is so errie knowing that there are thousands of people died inside this church during the volcanic eruption in 18th century. Children who sells candles for one peso are lighting up some of their candles putting them on the only left stoned cross. I didn't really have time to ask what's the real story behind this church but during the time we stayed there I felt a different feeling and the deafening silence makes you imagine the scream of fear of people who died inside this place. Time for work. Photoshoot haha. Behind me is the tallest tree I've ever seen just outside the church. Next stop, old walkway to the old volcano which will give you the overview of the island on top as you will have to take their hundred steps of stairs which we didn't do due to dehydrating heat of the sun. 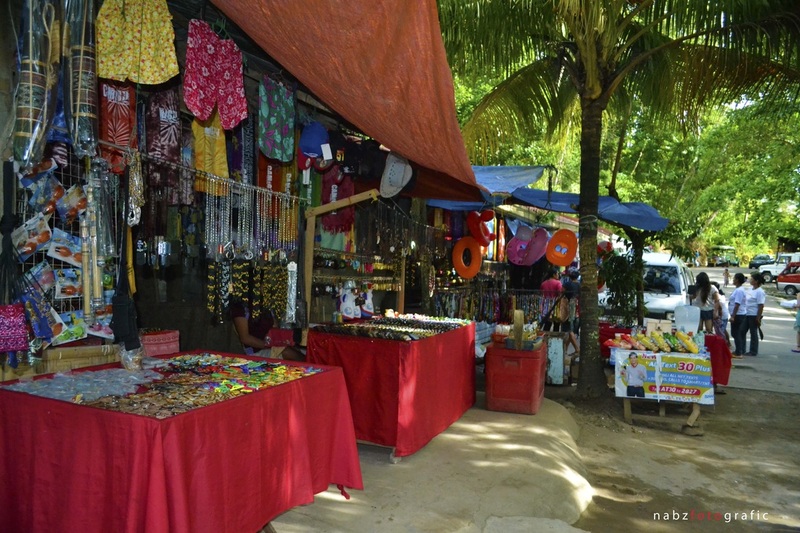 Infront of this attraction is their souvenir shops where we hurriedly visit for our pasalubong and souvenir. With my kiddo looking for best keychain souvenir. This place I thought is the most highlight spot of this island. The place has been featured twice in two of Filipino movie "Ikaw lang ang mamahalin" and Quija. During the 18th century the cemetery and some of its neighboring cities got sunk after the volcanic eruption. It is famous for snorkeling activity as you will see some of it's ruins. One of which is the big cross under the sea. 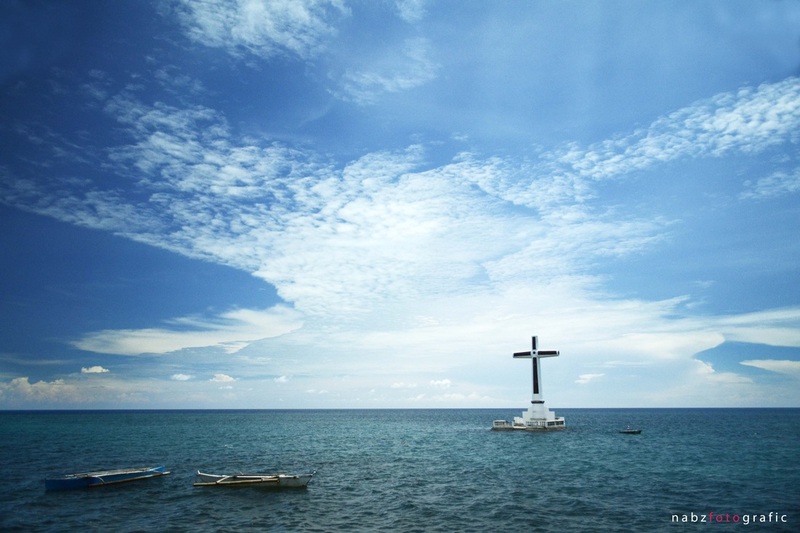 The visible cross symbol was just made to commemorate the sunken cemetery. This waterfalls plunges 75 meters into a rock pool surrounded by enchanting wild ferns, trees, boulders and orchids. Surely, you would love to try diving in this waterfalls but it's a no-no. The water is sooooooo freaking cold which will shiver your inner soul haha. I'm the most weakest person when it comes to cold water. I always read blogs about this falls but wasn't really entice maybe because we have kawasan falls in Cebu which I visited few times. So I thought it would just be another waterfalls I've been to. But when we got there I felt surreal. I was totally in love in this falls. It is truly surrounded by beautiful fern trees and the atmosphere is really cold which gives refreshment and will let you escape from scorching heat of the sun. I just love the food for our lunch adding the very beautiful scenic view from the background. Winner! Just outside the waterfalls there are a lot of vendors who are selling the known food in Camiguin that is sweetened "kipling". A must try food. Our last stop was ardent hot spring. This place is at the tip foot of active volcano Mt. hibok hibok bubble the minerals of ardent hot spring. Their pools has different level of temperature which gives you soothing feeling after. 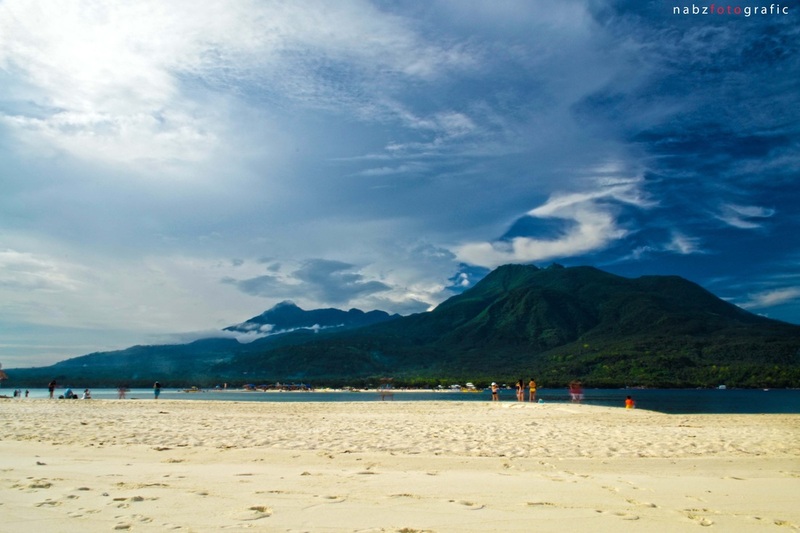 Behold to the exquisite beauty of white island Camiguin. Its pristine white sand and turquoise blue water with the very fascinating Mt. Hibok hibok from the background will surely lure your eyes. For travellers it's like a food for us. I couldn't close my eyes the whole duration of our stay here. Totally hypnagogic, jaw dropping wonder of nature. I was really having hard time shooting as it was soooo early in the morning around 5:30 am. I know what you're thinking so early but looks like it's around 8am or nine. If you have plan of visiting this island the best time to go here is around 5am till 9am or 4pm in the afternoon as the sun here is no joke freaking hot. No trees and shaded place where you can hide from the sun. Although there are vendors but that's it. Sunblock won't stay longer. So hello sunburn. If you're a big fan of Pastel originally made from camiguin you will see this white island as part of their logo. Finally I found you! 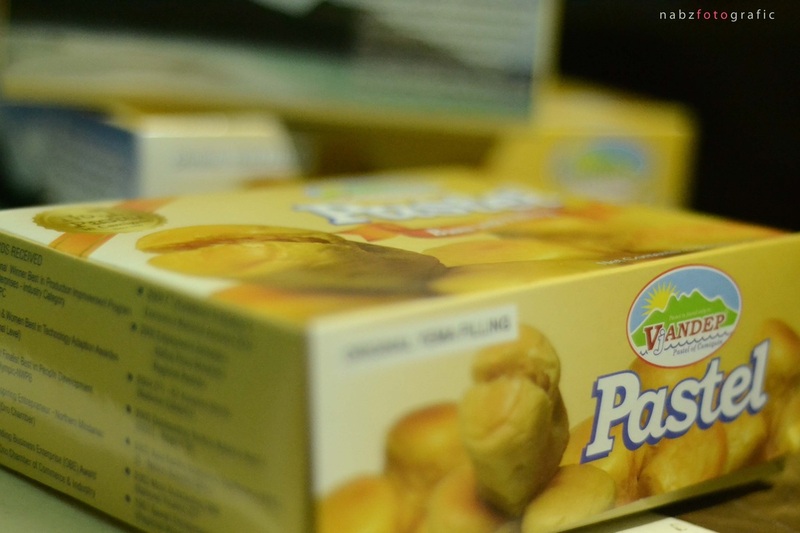 Before leaving this island we dropped by to their market in Mambajao to buy some pasalubong from Vjandep bakeshop the original maker of the famous pastel.
. 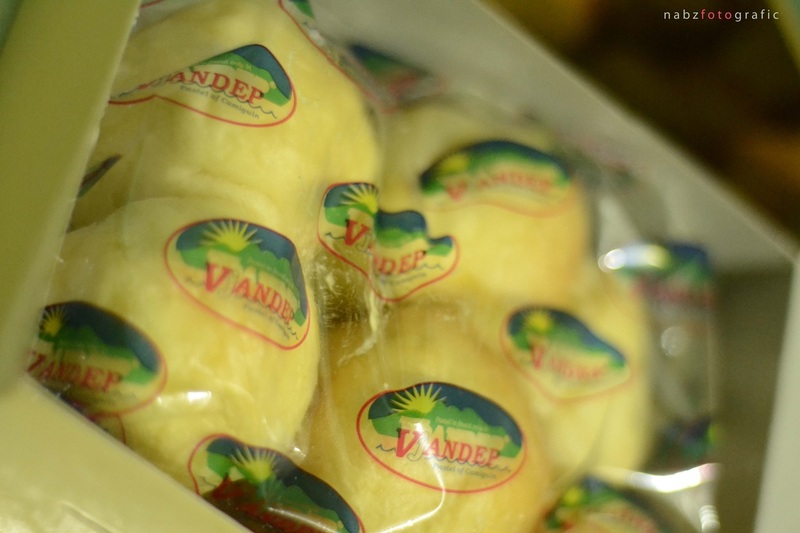 This mouthwatering food from Camiguin is a buns filled with custard. From the Spanish term Pastel means cake. 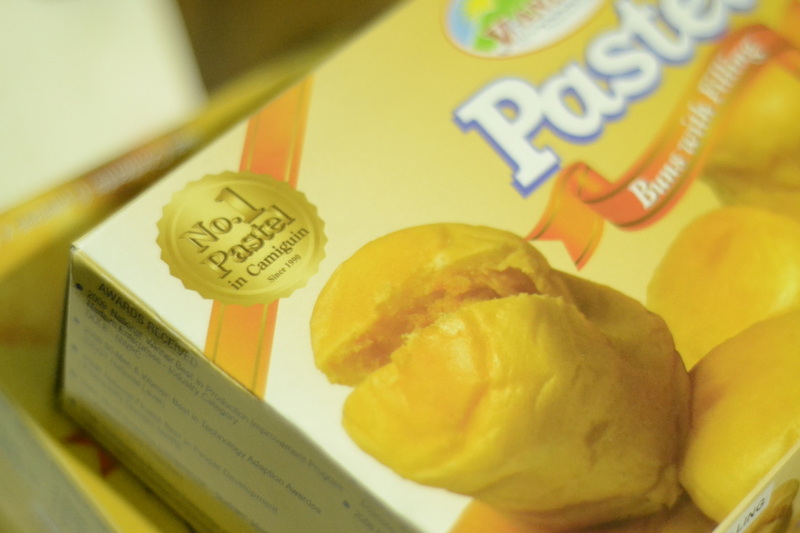 Here they offer several flavor ube,durian,newly bavarian flavor and the most best seller would be yemma. You'll love it. 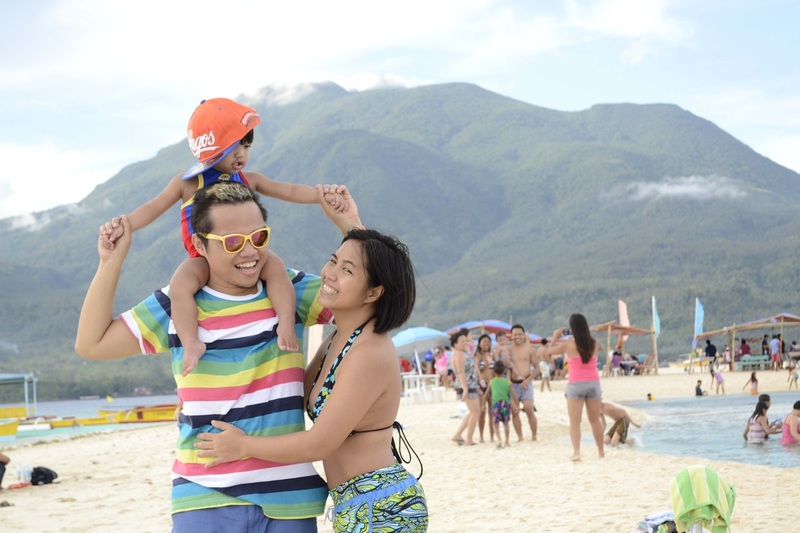 This completes my entire Camiguin Trip with my family. Truly Camiguin "Ikaw lang ang mamahalin". For direct flight to Camiguin you may visit the link below. 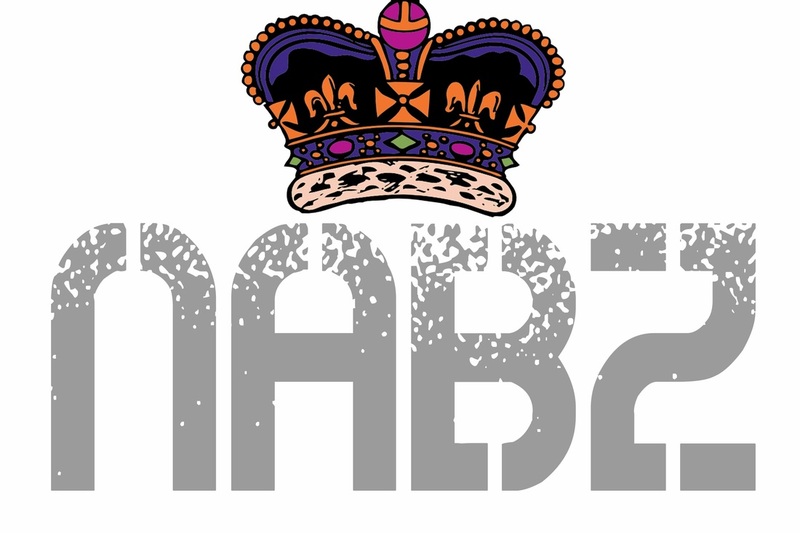 If you find this blog helpful you may leave your comments or send in your questions by filling out the form below.